Which one do we need: orthodoxy or humility? Both says Joshua Harris! In fact, we don’t have the luxury to choose one at the expense of the other. Or as the subtitle of this volume published by Multnomah says, we should be “holding the truth high without putting people down.” So what does that leave as the goal? What he calls humble orthodoxy. This is actually a reworking of the last chapter of his Dug Down Deep. If I were forced to choose I would prefer that volume to this one as I really enjoyed reading it. Still, this book has something to say and I need to hear it. Our tendency to be a Pharisee, our latent idolization of self, our propensity to be so impressed with who we are and what we know, he exposes with care. He says, “The message of Christian orthodoxy isn’t that I’m right and someone else is wrong. It’s that I am wrong and yet God is filled with grace.” Ouch! We have the wrong focus to make correct theology, as critically important as it is, the goal. Our Lord is the goal. Any other goal is inferior and little more than misspent effort. If correct theology is the goal I can so easily look down on others who I know has less theology than me. I know I have fallen in that trap before and am glad I had Mr. Harris to take me to task for it. He attacks “arrogant orthodoxy” as actually falling short on the orthodoxy scale rather than the other way around. He sees true theology as telling me that repentance must start with me. Well, he has us there! He sees a interlocking link between orthodoxy and humility. 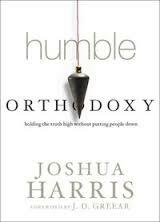 More orthodoxy leads to more humility and more humility leads to more orthodoxy. When our pride grows, what, then, does that tell us about our orthodoxy? That is a painful, yet particularly helpful, insight. As much as I want to have my theology right, there is enough remaining sin in me to keep me humble, he says. You can speak for yourself, but that really describes me. A critical spirit, though a spirit quite at home in our age, is pure nonsense in a sinner like me. I must defend my faith without reducing myself to a critical spirit that denies on many levels the very faith I defend. He also says: “Friend, the truth is not about us. It’s not self-determined. It’s not an accessory. It is about God.” That will help us not develop a Christian subculture with all the weirdo that can accompany it. He also says: ” In eternity we’ll see the silliness of self-righteousness and quarreling over the nonessentials.” That sums it nicely for a book well worth your time to read. I hesitate to tell you that this book tackles with verve the theological ideas of original sin and union with Christ. I can hear the groans–another theology tome. Please reroute your thinking as this volume is so much more than academic exercise. 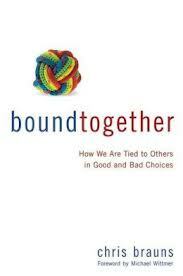 In Bound Together by Chris Brauns and published by Zondervan we have so much more! There’s real life questions here. In discussing how we are tied to others in both good and horrifying ways, we find the questions tough. We all know on some level, and are actually glad about it, that blessings have come our way over the choices of some. But when someone’s choice rips our family down the middle, or the choice of a leader lands the whole nation in peril, well, that is another matter. The deeper question is why the Lord designed our world so. Like it our not, He did. Mr. Brauns uses the analogy of the rope. We are tied together. In some ways if one goes over the cliff, we all will. While that is not true on some levels (personal accountability), it definitely is on others. He shows that what happened to us when Adam fell demonstrates this very thing. Before we sink in despair, we should see the upside of the rope. CHRIST! We are now tied to Him and as he triumphs over sin He literally pulls us up out of or own sin. You see, the rope rescued us. If you could remove the rope from God’s Universe, you would do yourself far more harm than good. So we praise Him for the rope even if on occasion it appears unfair. He also explains that the new rope in Christ is far stronger than our old rope tied to Adam. No, he explains, this doesn’t extinguish personal responsibility. I can’t just blame the rope, but I can trace how my choices have the potential to pull up or down. In his one chapter on marriage you see how the home might be the greatest length of the rope. Any idea that I am just my own person and can do as I please is absurd. There are too many hurting children in our world, for example, for this to be true. He offers hope to hurting families too. He uses Rahab as an illustration. The rope can be used by me for good. She made a daring decision and her entire family was spared. This may not always work out so, but at least it is a shot. In the latter parts of the book he explains how something so valued in our culture, and truly good on some levels, could be the very thing that is destroying us. That thing is individualism. He pulls off the theology too. By the book’s end you will add to your obvious knowledge that your personal sin affects you and others as well as the truth that original sin affects you too. That affect is only overcome through Jesus Christ. This is a great book. How would you like a book that addresses parts of the Bible that you have always found difficult to get anything out if? How about, for example, genealogies? How about questions on the races and languages of our world and how exactly the Tower of Babel episode really played out and shaped the world we know today? 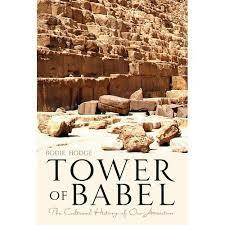 Then you might really enjoy The Tower of Babel by Bodie Hodge and published by Master Books. I’ll confess some of the material may be too narrow in its appeal your taste. Discussing how to pronounce “Babel” may not be a question you have had a burning desire to have answered, but I assure your other parts like chapter 13 entitled ” What about Extra-Biblical Tables of Nations and Genealogies That Go Back to Noah?” are riveting. Finding the names of the Biblical genealogy is exciting. I didn’t need that discussion to believe myself, but that doesn’t mean I don’t enjoy reading it. Mr. Hodge is good at seeing what is really at stake. The authority of God’s Word is, as always, the heart of the issue for these type discussions. When he shares what might at best be esoteric knowledge at least he confesses when he is speculating and he faithfully brings us back to core issues. He may at times revisit subjects that we thought we had a handle on, like the division of the continents being in Peleg’s day or the dating of the Book of Job, but whether you agree with him or not, you will be given substantial food for thought. There may also be places that are too detailed, like an in-depth analysis of the genealogy as it relates to today, but it still makes a wonderful reference to pull off the shelf. Too bad there isn’t an index. The last chapter is short but ends where it should: Christ. In other words how does this fit in the big picture? How does it fit in me? Put this down as a fun read. Can anyone really share the Gospel like Charles Spurgeon? He had a way of dissecting the human heart and finding the chasm needing Christ that dwells within. Excuses? He could anticipate the best of them and slay them before they could hardly be off your tongue. In other words, he excelled in understanding the human heart. That is one of the reasons he was such a great preacher as well as why when he wrote his Advise For Seekerse should listen with care. As a nice bonus, Attic Books has reprinted this jewel in a small, attractive hardcover volume. The self-righteous man knows that what he is doing cannot satisfy God, for it cannot satisfy himself; and though he may perhaps drug his conscience, there is generally enough left of the divine element within the man to make him feel and know that it is not satisfactory. We know he is dead on no matter what we would like to believe. It is such a dead-end road that we must turn toward Christ. Jesus can heal you of your pride; he can deliver you from anger; he can cure you of sluggishness, he can purge you from envy, from lasciviousness, from malice, from gluttonly, from every form of spiritual malady. How’s that for putting the good back in the good news of the Gospel? While he could write with devastating accuracy of our sinful hearts, he could also write with such beauty the love of Jesus. O how He wants to save us despite all we have done. In later chapters he writes of Jesus as one who says “come”! This book is from the 1800s so of course it is the language and punctuation of that day, but I suspect you will be little at a loss. Whether you are a seeker yourself, or one who works with seekers, you will find this book, as with any Spurgeon title, a real treasure.